This was quite a different DXpedition. 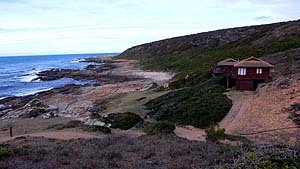 A couple of us Cape DXers were supposed to go to Seefontein on the Western Atlantic Ocean coast where we had booked for the equinox. But a bare few days before departure the owner phoned to say that the usually dry saltpan at Seefontein had flooded and was now inaccessible, even to my DX pal Vince Stevens' 4x4 Landy. So that was out, but I was quite determined I wanted to get away for a good radio session so thoughts of Jongensgat on the Indian Ocean East coast came to my mind. 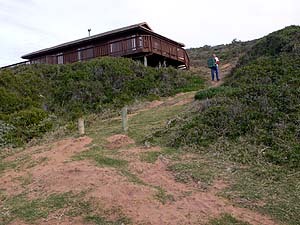 This was a problem though, as in the last year I have become a semi-invalid in my 70th year and can no longer cart heavy radio equipment up the high dune from the Jongensgat parking area to the cottage. 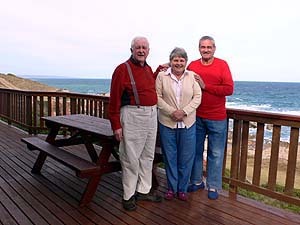 But fortunately a friend, Willie, had already volunteered to come with us and heave all the heavy gear up the dune, as he was a very keen fisherman and Jongensgat is a fisherman's paradise. And so it was arranged at very short notice the day before our departure. Willie came over and talked about the trip and the question of which radio to bring along was discussed. Of course I would like to take my giant Cyclops II (the Icom IC-7700) along, but packed in a suitcase it weighs a backbreaking 35kgs/80lbs!!! Willie, who is immensely strong went and picked it up and said "no problem", so along it came. Monday morning 8.30 a.m. Willie arrived and did the loading of the heavy gear for us and at nine Dawn drove us down in the heavily packed Toyota Avanza. It normally takes all the gear for just the two of us with the loading area enlarged by folding away the passenger seats, but with Willie coming there was much less cargo space, but with a squeeze we managed it. At Stilbaai, the town about five kilometers away from Jongensgat, we shopped at the local supermarket for food and booze and got to the cottage early and had to wait for the keys. Willie took all the heavy gear up the dune including the immensely heavy radio and didn't even break a sweat, Dawn did less well and was well and truly fagged after bringing some of the light stuff up the steep dune. After a bite of lunch and a beer it was time to instruct Willie on the intricacies of the stringing out and laying down of the 350 meters/1200 ft of beverage antenna wire. He set off up the hill in the thick brush thinking this was the easiest part, but arrived back considerably later complaining like hell that I had given him three kilometers of wire and not 350 meters!!! It is indeed heavy going laying out beverages in such hilly and hostile conditions. However later results showed he had done a marvellous job. 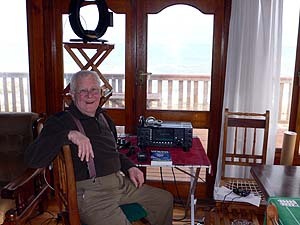 At 4.00 p.m. all was ready and I fired up and tried the 14meg ham bands and the WWV/WWW stations - 10 megs looked good, so I listened to the hams awhile whilst waiting for sundown and the MW to come through, which it did at 5.48 with the appearance of 1359 kHz WYFR Fanglio Taiwan. Official sunset was at 1625z/6.25 local so I was waiting with foetid breath for some rare Australians and some Japanese and Philippinos to come in. As the evening progressed, it became evident that this was to be the worst evening session ever at Jongensgat as nothing of any great interest appeared, and the West Coast Aussies that usually boom in well before sunset were absent - very disappointing! All that could be salvaged was some more of the very high powered Taiwanese stations, some Africans and the Indian Ocean Island stations, so I went and dossed down early. Fired up again at 2.00 a.m. with a big mug of strong hot tea and a NDB beacon that my European pals yearn to catch was coming in nicely - "CRJ" Carajas Brazil. Up the band and WWRU Jersey City was logged, bringing hope of more U.S. stations. Alas, no more came through, just lots of Brazilians which I am not much interested in. To assuage my disappointment at least 1610 the Caribbean Beacon could be logged spewing out hot gospel. So in desperation I left the MW band and went and chased the NDB beacons on LF and soon had a clutch of good catches from Brazil over 4000 miles/6500 kms away plus Ascension Island, which I would dearly love to log on MW, but haven't. After first light one usually expects a bonanza of rare U.S. stations but nothing came in at first light and sunrise this disappointing morning. So instead I went to the SW band and sussed out as many AFN stations as I could, and got Pearl Harbour, Diego Garcia and Key West FL (plus Guam later in the evening). The day turned out quite miserable with a late Antarctic cold front sweeping past with rain and a howling freezing gale with huge sea swells crashing on the rocks below us. Our poor fisherman Willie said fishing in such huge swells was a no no, so Dawn brought out a jigsaw puzzle and they got busy on that to idle the time away. About 9.00 a.m. a whale swum lazily by not far from the rocks - it was quite the largest whale we had ever seen and we stared amazed and fascinated through the binoculars at it. Lunchtime we went to Stilbaai, the small town five km away and bought fresh fish (hake) and chips (French fries) and enjoyed that washed down with a nice Cape Sauvignon Blanc. Dawn bought some pre-prepared food for dinner later. At two p.m. the power went off which was a bit worrying. I decided to do nothing and wait a bit to see if it would come on again. 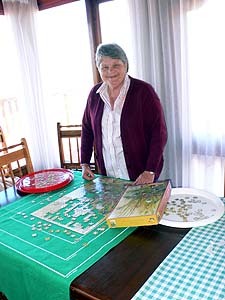 As there are no phones or cellphone reception at the cottage, I could not make enquiries. By 3.30 I was getting in a bit of a sweat and about to drive up to the main road to acquire cell phone reception, when hallelujah! the power came on and stayed on. What a relief! as the thought of a powerless night was too devastating to contemplate. After listening to the hams a bit, I tried the aero utility bands and at 1522z got a superb catch: 5643USB San Francisco ATC working Quantas 25 near Honolulu on the Honolulu relay TX - that's our antipodes and one hellava long way away, and I haven't heard that station for years = very pleased. At 1600z 1170 VOA relay from Luzon came through, the 800 Kw TX from the Philippines. It's going to be a promising evening I thought. Soon the West coast Australians were pouring in, and Perth on 720 so strong I could actually hear it on the portable with just the ferrite internal rod. Sadly none of the East coast Aussies though, so the evening session ended with just a few Europeans and the usual African's and Indian ocean catches. Due to nearby development Jongensgat is no longer so electrically RFI quiet as it used to be, and as a result of government policy all the quiet incandescent lights have been replaced by very noisy fluorescent energy saving lamps. These lamps unfortunately kick up a hellava din and quite spoiled my evening sessions with noise. Fortunately most seem to get switched off in the early morning so I had some quiet early morning sessions. For dinner Dawn had got a lovely succulent piece of ham that she made a very tasty sauce for and we washed that down with a nice cabernet sauvignon. At 1921z on 684 I got Larry London presenting "VOA music mix" but back home for the life of me I can't figure out which station it was coming from. So the evening ended less than spectacular with no Japanese or weaker Philippino's and no Eastern Aussie's. I am not very well up on the Philippine language, but heard what I thought was one on 999, but like the fish that got away, when I listened more carefully to the recording next morning it was a low powered RAI Italian. On rising at two a.m. I found the band full of Brazilians and nothing else, so tuned down to find some more NDB beacons on LF. This brought in a whole new batch of far off Brazilian East coast beacons that I was very happy to have. Back on the MW band 1540 Nassau Bahamas was logged with the usual gospel then later at first light WWWT Washington DC was heard. Just as conditions were fading and the sun well up, the big enchilada of the trip came in: WTDY Madison Wisconsin on 1670. I was thrilled with that as it is 8770 miles/14100 kms away from the DX site. Not a bad session with a good solid new catch to be satisfied with. The day turned out much nicer with a cloudless sky and light wind, but the heavy swells from the storm were still disturbing Willie's fishing, so he contented himself for searching the rocks for shell fish, of which he later brought a big bagfull home. Dawn and I went into the little town and while Dawn shopped I had a session at the local internet cafe. We lazed about in the afternoon soaking up the lovely weather and the magnificent view along the coast from the cottage deck. This started off promisingly with Perth 720 booming in well before sunset, but alas, apart from the low power ABC Perth on 585 and 882 no other Aussies came in that evening, nor Japan = disappointing, as these stations are supposed to be the cream on the top at Jongensgat. We then broke for dinner and Willie and Dawn had prepared a braai (barbecue) of boerewors (spicy sausage) and lamb chops washed down with the usual red wine, this one a very pleasant blend of cabernet/merlot/shiraz. The rest of the evening brought in India, Hanoi, Cyprus, Ethiopia, China, UK and Iran. This started off poorly with conditions fading at four a.m. and totally dead by five. All I could get was some Africans: Radio Free Africa from Mwanza Tanzania and a good catch not heard before of 1152 R. Nacional from Mbanza Congo in Angola. I played around with a few of the powerful Brazilians left and then at sunrise at 0430z six thirty local time 1700 started coming in with ID's of WRJR. This mystified me as the usual station here is KVNS Brownsville TX. It was also playing "oldies" which was not listed in WRTH, nor was WRJR on that frequency. It was only when I got home that with the help of some pals on the internet I as able to establish that it was indeed KVNS as they had a syndication running. Also pals with much better audio equipment and ears than mine did dig out a KVNS ID off my mp3 recording. It's a nice catch 8800m/14000 km away, but it has been heard and QSL'd many times by all of us. So that ended the session and the DXpedition, not on a very high note, but some solid catches were heard and that great one of Madison WI, so I was quite happy that it had been worthwhile coming as usual to this magic place. I am not including a table of the logs here as they are much the same as our previous DXpeditions here. Then it was packup time and carting all the heavy gear down to the car at the bottom of the dune some distance away. After letting the sun dry out the antenna wire, Willie went up the hill to roll in the 350m of wire in from the thick brush. I instructed him how to do this without fouling the wire and warned him that reeling it in was harder than rolling it out. And so it was, it took him about forty minutes and he was quite put out and again insisted I had given him three and a half kilometers of wire and not 350m....!!! It's a hard job on a steep hill with thick brush. Poor Dawn then had a bad drive home as another storm front was approaching with a gale force wind buffeting the little Toyota and causing it to skitter all over the road. The massive Icom IC-7700 performed flawlessly and gave superb reception, although I was disappointed that the NB noise blanker could not get rid of the noise from the fluorescent energy saving lamps. The 350m beverage did exactly what it was intended to do, so Willie must have laid it out well according to my instructions. As for the Kiwa MW Loop it has been a dream piece of equipment over the 15 years I have owned it, always coming up with the goodies when you are in a tight spot. This time round it was particularly good at digging out European stations that the beverage could not get. Although it does a good job nulling when you are looking for Europe, it does not nulll out the Brazilians to enable you to find the weaker North American stations. The reason for this is that if you look at a great circle map you will see that the North and South American signals converge on a very similar path, thus if you null one you null the other as well = pity!